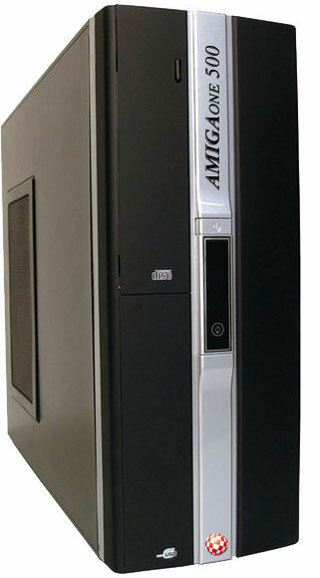 The AmigaOne 500 is a complete computer system based on the Sam460ex board (1.15 GHz). It comes with 2 GB RAM, an AmigaOne mouse, AmigaOne keyboard stickers, a 500 GB SATA HDD, a DVD-RW drive, a SATA controller PCI card, a case (featuring Boingball and the AmigaOne 500 logo) and an OEM version of AmigaOS 4.1 (components can be changed or added in the configuration menu). Item currently not available, ETA September 26, 2011. What!!! 1.050€ for this hardware?? This is a joke??? EFIKA 5K2 PowerPC G2 400Mhz, MorphOS 2.7, 128MB 266MHz DDR RAM, FSB 133MHz, 500GB HDD, Radeon 9200 PRO 128MB, USB HUB x8. There is a lot of speculation that the X1000 will be released soon and priced similar to this. So who is going to buy it? Do we really have to complain about the price? I don't live in the EU, so I wouldn't have to pay the German VAT - so maybe that helps shave off 19%. Eh, either buy it or don't....I can't say as I blame someone for not buying it. But this is a niche market, and I, for one, am happy about the state of hardware - relatively regular updates - occasional opportunity to buy one in-stock, and not on some pre-order scheme. And its actually cheaper than a big box Amiga used to cost. Yes, I know 1.15Ghz PowerPC isn't going to light the world on fire, but, neither is AmigaOS 4.1. It's a hobby - I wouldn't mind thinking about one - to tell the truth. I'm all Mac's right now, an Amiga would be a nice addition. For being a hobby, it seems increasingly to be a rich man's hobby. And that is not limited to the AmigaOne series either. Whew, thats a lot of cash. I'm glad I chose to stick it out with MorphOS. These prices remind me of the old days when I had to save for months just to get a 4MB RAM upgrade for my A1000 and a Starboard II hard drive controller. Only in those days it was cutting edge technology. Damn, this is all the "secret project" was? Im a little disappointed. What was with the boing ball in the picture then? I dont see the connection. The "its cheaper than the old big box" arguement doesnt really hold much ground for me either. Back then a harddrive was hundreds of dollars, ram was hundreds of dollars and so on. The ROMs were an extra cost and so on. I do understand why these things are so pricey, but that particular arguement has a tendency to come across as clutching at straws for justification these days (not particularly directed at you MarkTime, but I do see it often used). Near as I can tell this is where I write something under the guise of being innocuous, but really its a pot shot at another persons/peoples choice of Amiga based systems. Unfortunately only I cant see how transparent and petty it makes me look. Why not an Amiga laptop based on the sam460? Now that‘s something you probably can‘t make it yourself easily. Anyway, here is a recommendation for the guys behind this system: If you don‘t manage to sell the quantities you expected to sell (not unlikely considering the one grand price), sell just the case at the price of an ordinary case + 10$ markup. At least that way you “ll cover you expenses. Well I would say "If you don't like it do something about it" but your doing it already. Keep up the good work on the Natami SamuraiCrow, it's more likely to get my cash than any other amigoid system as things currently stand. Falling into a dark and red rage. Well not considering the price, I kinda like it. But the price range is a bit out of my reach. Alien Air Attack html5 version. Uggghhh...that looks just like an old piece of Samsonite luggage I once owned back in 1973. I think you have your numbers wrong. An X1000 for that price??? Yeah, he left out the x 3 multiplier on the X1000 price. I really thought ACube was going to introduce Natami w/ AROS. Life begins at 100 MIPS!